LANGLEY TIMES – For Georgia Ellenwood, it was all about the medal. “I remember thinking I didn’t even care about a PB (personal best), I just wanted a medal,” she said. And it was mission accomplished for the 18-year-old as Ellenwood captured the bronze medal in the heptathlon over the weekend at the Pan-American junior championships in Medellin, Colombia. The championships are for track and field athletes ages 19 and under. She did manage a personal best, scoring 5,493 points, which was 32 points better than her previous best. Her latest score also ranks her 10th in the world junior rankings and third on the all-time Canadian junior list. The gold and silver went to Cuba’s Yusleidys Mendieta Valasquez and the United States’ Kendell Williams, who scored 5,627 points and 5,572 points, respectively. “It was kind of surreal,” Ellenwood said. “I was standing on the podium, thinking this is the first time I have been up here (at an international event) in front of all these people. “And looking at the athletes next to me, I was thinking these girls are what I used to look up to and now I am standing right next to them. This was Ellenwood’s third time representing Canada. In 2011, she attended the world youth championships in Lille, France and then last year she was at the world junior championships in Barcelona, Spain. “Both times I didn’t even come top 10, so this was a big move,” she said. Ellenwood was ranked third or fourth heading into the competition. “I knew I could medal (but) everyone is just so tight in the heptathlon, it could go any way,” she said. Heading into the final event of the seven-event heptathlon, Ellenwood was sitting third. She had finished second in the long jump (5.81m) and third in the javelin (35.61m). She also tied for third in both the 100m (14.43) and the high jump (1.74m). And she was sixth in both the shot put (10.44m) and the 200m (24.87). All that remained was the 800m, but the competitor who was directly behind Ellenwood, Argentina’s Fiorela Chiappe, is a strong 800m runner. Ellenwood knew that if she could just keep within three seconds of her counterpart, the bronze medal was hers. “I just stuck to her the whole race,” she explained. “By the last 50m, she started pulling ahead … I just had to stay with her as much as I could. Chiappe was first to cross the finish line among the eight competitors, but Ellenwood was just over a second behind. Ellenwood said she was at first tired immediately following the race, but that soon subsided and was replaced with relief, and finally excitement to stand on the podium. She is no stranger to winning medals, both at the provincial level and national level. This past June, she set a new record in becoming the first athlete to capture four consecutive B.C. high school track and field provincial heptathlon titles. 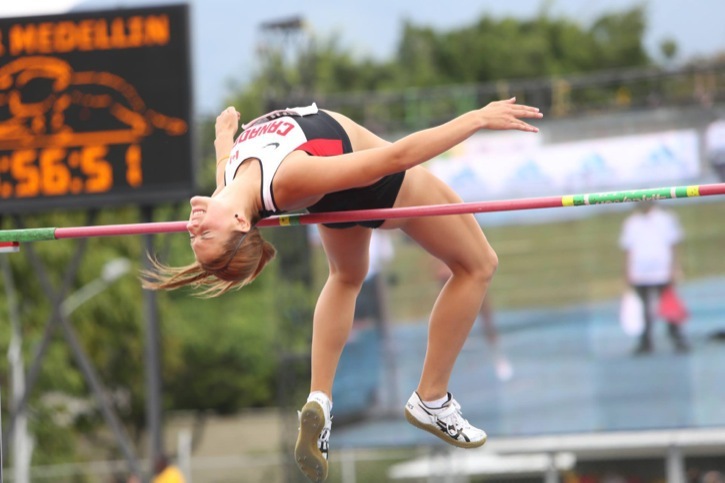 For her high school career at Langley Secondary, Ellenwood won 10 gold and three silver. The long-time member of the Langley Mustangs Track and Field Club also earned herself a scholarship to the University of Wisconsin, where she will compete for the Badgers at the NCAA Division 1 level. When Ellenwood spoke to The Times on Tuesday morning, she was tired from a busy travel schedule. She had gone from Langley to Toronto and then to Colombia and back again and was now busy packing for her impending move to Madison, Wisc. for her freshman year of university. Ellenwood was scheduled to leave yesterday (Wednesday) morning. Two members of the Trinity Western Spartans track and field team were also at the Pan American junior championships as part of Team Canada. And second-year Spartan sprinter Nathan George of Coquitlam helped the Canadian 4×400 relay team take bronze. George ran the opening leg. Meanwhile, incoming Trinity Western athlete Regan Yee of South Hazelton, B.C. finished seventh tin the 3000m steeplechase in Colombia. LANGLEY, British Columbia – Second-year Trinity Western sprinter Nathan George (Coquitlam, B.C.) will be coming home from the 2013 Pan American Junior Athletics Championships with a little heavier luggage as he returns from Medellin, Colombia with a bronze medal after helping Canada to a third place finish in the 4x400m relay this past weekend. George ran the opening leg for a Canadian quartet that crossed the finish line in 3:07.61 to capture one of Canada’s 19 medals at the event. The USA earned gold in 3:06.57 and Brazil came in second in 3:06.94. Individually, George, after qualifying for the 400m final with a time of 48.23 in the semifinal, finished seventh overall in the final with a time of 48.26. Canadian Brandon McBride, who anchored the 4x400m relay team, earned gold with a time of 45.89. Meanwhile, incoming Spartan Regan Yee (South Hazelton, B.C. ), who won the 2000m steeplechase at the Canadian junior championships in July, finished seventh in the 3000m steeplechase with a time of 11:13.61. Her time had her just one tenth of a second behind the fifth place finisher and just over a second behind the fourth place finisher. The winner finished in 10:28.94. The Spartans cross country teams open their season Aug. 31 when they compete in the Lake Padden Relays in Bellingham, Wash. The track and field teams open their season Jan. 12 at the University of Washington Preview.